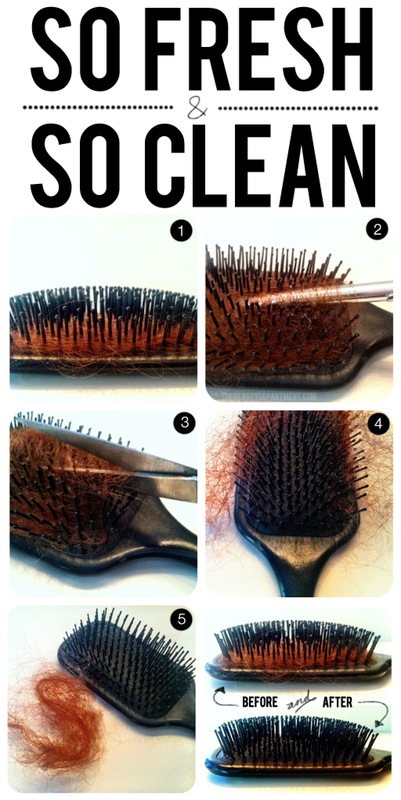 Grab any brush that’s gathered a visible amount of hair. Here I’m showing you how to clean out a flat (paddle) brush but this can be done exactly the same on a round brush. Next, go in with your scissors and cut straight down the middle as seen above. TIP: If you’re cleaning out a round brush, flip it over and do the same on the opposite side. Now “peel” the hair open and remove. You can go back in with your pen or pencil to loosen up any more tight spots. I like to shampoo my brushes each time I clean out the hair. To do that, just fill up the sink with warm water and add a tablespoon of cleansing/clarifying shampoo. Wash the brush + bristles thoroughly, rinse well, and let it dry (or blow it dry).